Announcement I am currently on maternity leave through the New Year. My ready to ship items are available for the holiday season, but I will not be making custom boards at this time. Thanks for understanding! I am currently on maternity leave through the New Year. My ready to ship items are available for the holiday season, but I will not be making custom boards at this time. Thanks for understanding! Ready To Ship Flower Toddler Busy Board! FREE SHIPPING! 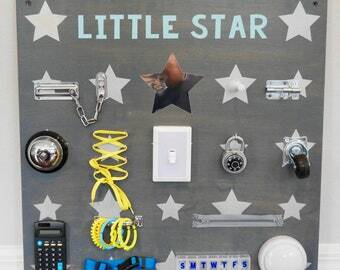 Ready To Ship Star Toddler Busy Board! FREE SHIPPING! Ready To Ship Mini Travel Size Busy Board! Cute elephant print! Perfect for travel with kids! Awesome Christmas or first birthday gift! Great item, very well made, it's better than I expected! fast shipping. This may be my go to gift item. Ready To Ship Mini Travel Size Busy Board! Cute star print! Perfect for travel with kids! Awesome Christmas or first birthday gift! Ready To Ship Mini Travel Size Busy Board! Cute truck print! Perfect for travel with kids! Awesome Christmas or first birthday gift!